CzBA se snaží podporovat mezinárodní mobilitu studentů a mladých vědců a tak uvítala zájem mladého ruského studenta o praktickou stáž v České republice. Bioplynová stanice v Třeboni poskytla na několik týdnů zázemí posluchači pátého ročníku Murmanské technické univerzity Victoru Pavlovi. S jeho písemným poděkováním bychom se rádi podělili. 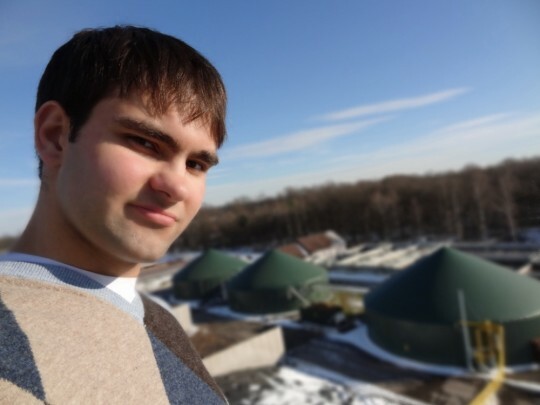 "As a fifth-year student of Murmansk State Technical University (Russia), I had my pregraduation practical training at the Biogas production plant, run by Bioplyn Třeboň s.r.o. On the site I got acquainted with work of the technological system of the plant and was comprehensively consulted about all its steps. As an assistant, I was involved in the chemical and analytical activities, taken place at laboratory of the company. Apart from these, I had a great chance to communicate with workers of the company and take part in the excursion, organized by my practical training supervisor from Bioplyn Třeboň s.r.o., Miroslav Kajan. The overall experience, obtained during the practical training at the company, is absolutely valuable for me. And I am more than happy that I had a possibility to go there and gather information about Biogas production technology. Hence, I would definitely like to thank the organizers of my practical training. My first acknowledgement is of Czech Biogas Association, especially, Jan Matějka, who helped me to find a company to have my practical training. I would like to express my special gratitude to Miroslav Kajan, Chairman of Board of Czech Biogas Association and Director of Bioplyn Třeboň s.r.o., who let me a chance to go to his company and who was my supervisor during the training period. My sincere thanks are due to him for all the help, encouragement and support given. I deeply appreciate it."